Each year, ICTE Japanese English language students such as Misako Ono celebrate their ‘passage into adulthood’ in Australia. The Japanese ‘Coming of Age’ ceremony, Seijin shiki (成人式) is traditionally held on the second Monday in January and marks an age of maturity (20 years) and an increase in responsibilities expected from new adults. The University of Queensland’s Institute of Continuing & TESOL Education (ICTE) annually celebrates this important milestone in Japanese style each year and held a ceremony on Monday 14 January 2019. This is the 11th year ICTE has held this special event and this year there were 30 Japanese ICTE students in attendance along with special guest, Mr Kazunari Tanaka, Consul-General of Japan for Brisbane. In his speech, Mr Tanaka gave the students his advice and guidance as they enter a new phase in their lives as young adults in modern Japan. The UQ Taiko, drumming team provided a spirited start to the evening by playing traditional music on their oversized drums. For Misako, it is her first time away from her parents for an extended period of time. 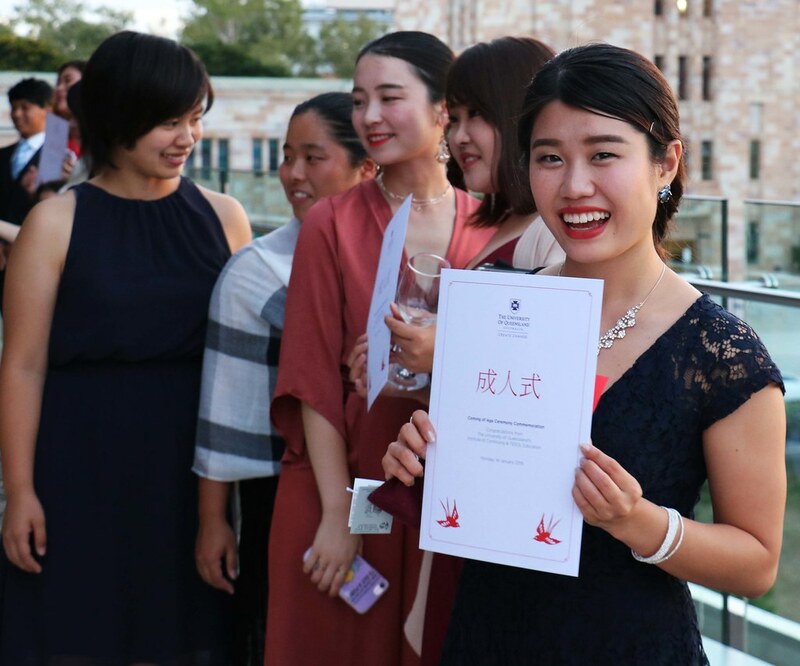 After completing her English language studies at ICTE, she is planning on studying one Semester at The University of Queensland before returning to Japan. Many Japanese students choose to live with ICTE Homestay families during their English language studies and were excited to be able to celebrate and share their home culture with their host families and friends attending the ceremony.